Tucked away inside the commercial complex of Straw Valley, Namu exudes a captivating tranquility. With a zen garden in its outdoor space and a quaint indoor space filled with eclectic wood fixtures, the restaurant hosts a muted colour palette of sandy bamboo, natural wood and abundant verdure. Complementing the earthy tones are clean lines of the mid-century modern furnishings and a pour of natural light that softly illuminates the glass-enclosed interior courtyard, producing an airy, relaxing setting for al fresco dining. Owners Bo Kwon and Joe Choi own the food trucks Bo’s Kitchen and Bulkogi respectively. Last year, Kwon and Choi combined forces to open Namu, a counter-order, table service restaurant complete with a full coffee bar. From in-house prepared kimchi to little pockets of mandoo, a korean style dumpling that can be either steamed or pan-fried, they strive to provide “approachable” traditional korean dishes as well as fusion-oriented plates. Namu’s most popular dish is the “bibimbap”: literally meaning “mixed rice”, the dish consists of a warm bowl of white rice, sliced cucumbers, shredded carrots, marinated bean sprouts, and Korean barbeque, all topped off with an egg fried sunny-side up. Another popular item at Namu is the “Kimchi Bul-Fries”: decadently crispy waffle fries, Korean barbeque, kimchi, a four cheese blend, and fresh cilantro, finished off with spicy aioli, an egg, and a sriracha-based sauce. Other fusion items on the menu include tacos, burrito bowls, and quesadillas. At the coffee bar, Namu also serves up a sparkling yuzu tea. Traditionally termed as “yuja”, yuzu fruit is preserved as a marmalade, which is then mixed with hot water to create a steaming, yet refreshing, sweet citron tea. Going beyond traditional Korean staples, Namu strives to accommodate the varied preferences of everyone in the community through their wide range of choices. 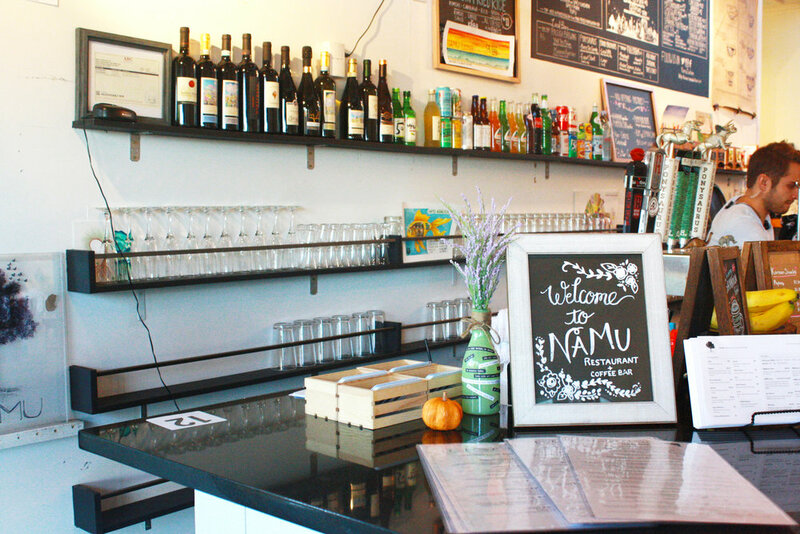 Since its opening, Namu has received a large amount of support from the Durham community. Preserving the passion and quality of food but balancing the fast-paced energy of their food trucks with the undisturbed peace of their new space, Kwon and Choi have created a vibrant sanctuary for one and all. Whether it be students looking to sidestep the white noise of campus life, or families and friends seeking a heartwarming evening, Namu delivers on all fronts.